The APSIN3000 is a compact, high performance signal generator with wide frequency coverage from 9 kHz to 3300 MHz, sub-Hz resolution, and broad power range up to 13 dBm. It provides excellent signal quality with low phase noise, good harmonic suppression and low spurious. It has an internal OCXO reference and can be locked to an external reference. 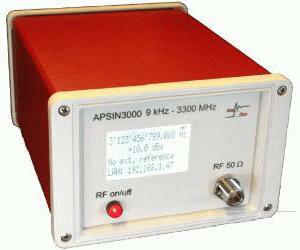 The APSIN3000 is available with an optional internal battery and weighs less than 3 kgs.